Inspired by Tibetan prayer bells, this pendant's lilting tones remind you to stay present. Beautifully hand sculpted by artist Jen Pleasants, this organically shaped pendant was inspired by meditative Tibetan bells. 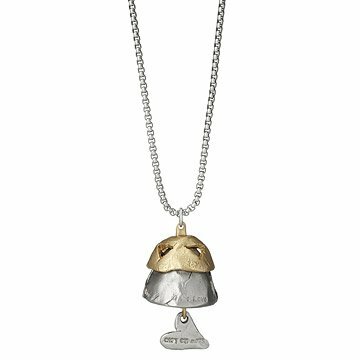 Rung to keep the listener serene and to aid in meditation, the bells' soothing tone take on a peacefully portable perk in this work of wearable art. A trio of stainless steel, white brass, and recycled gold pair to create an intriguing silhouette, while the gentle tones it produces bring a lilting reminder to stay true to yourself. Handmade in California. Love the sound and the motion of this pieces. I hate static jewelry without deeper meaning and this piece has many beautiful aspects. It's bigger and heavier than I anticipated - and I think on a small person could be too long and to chunky. However, it fits my athletic frame and big neck perfectly. This item was not as described. Good hype, but no sound = fail. Lovely sentiment invoking the peace of Tibetan culture.